Helen Nichols was not much of an actress, but she wanted to be. She asked cousin Ginger Rogers to show her the Hollywood ropes, and Rogers dreamed up the stage name "Phyllis Fraser". She appeared in several long-forgotten movies, and one film that is still remembered -- Winds of the Wasteland, in which Fraser batted her eyelashes at stagecoach driver John Wayne. After about ten years in Hollywood, her acting career petered out, and Fraser worked as a reporter. 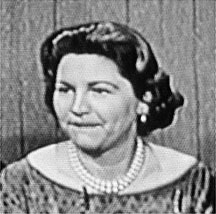 She married Bennett Cerf, founder of Random House and a longtime panelist on What's My Line?, and after his death she married Robert F. Wagner, former mayor of New York City. As Phyllis Fraser Cerf, she wrote The ABC and Counting Book, a kids' title which remains in print. More notably, she co-founded Beginner Books, Random's imprint for young children, along with Ted Geisel (better known as Dr. Seuss) and his wife Helen Palmer Geisel. Fraser compiled a list of 379 words considered among the absolute basic vocabulary of the youngest readers, and set the rule that Beginner Books could use only these words plus twenty "emergency words" per book. Beginner Books published its first four titles in 1958. Two years later, it was earning a million dollars a year, and Random House became the largest publisher of children's books in America.